A film that amounts to so much more than the sum of its part. 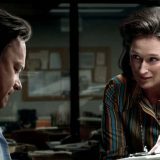 The Post tells a fascinating true story from the point of view of two characters it is impossible not to be enthralled by. Long before Woodward and Bernstein uncovered all things Watergate related it seems The Washington Post was already at war with President Nixon. Or rather at war with the Vietnam War. The Post tells a fascinating and lesser told story about how the USA was determined to carry on with a war they knew they could never win. That the film brings together the Hollywood powerhouses of Spielberg, Hanks and Streep – notice how none of them require first names – makes this an even more tantalizing prospect. Only Spielberg could deliver such different films in the space of a year as Ready Player One and The Post. One is pure popcorn entertainment, the other is a thinly shrouded essay on topics that are arguably more relevant today than they were then. From the gender politics of Graham taking over the newspaper, inheriting if from her husband who was put in charge by her father, to all things ‘fake news’ and allowing the press to do their job and tell the public what is really going on. 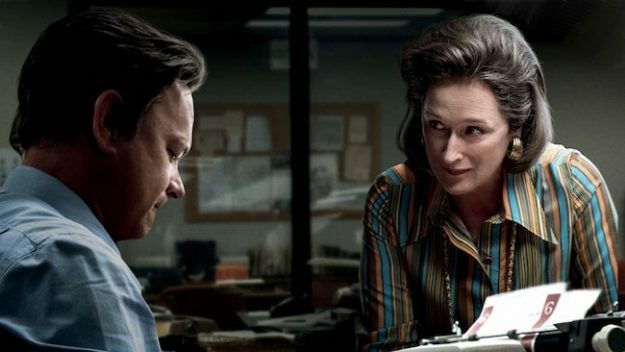 The plot itself is gripping but The Post is at its most riveting when dealing with the bigger issues. Spielberg is clearly relishing telling this story and in particular Graham’s narrative. A scene early on sees her pass through a group of wives and secretaries to be the only woman in a board meeting. Mostly ignored or at least undermined it smartly paints a worrying image of a woman’s place in the 1970s. But the real fist pump moments come in two scenes later, one in which a room full of men all turn to Graham to hear her final decision, their every breath hanging on her words, and the second a crowd of women looking on in admiration at a woman blazing a trail where others have never had the chance. Naturally The Queen of Hollywood Meryl Streep dazzles in these moments, holding both audiences – us and those in the film – utterly captivated. In a story based so firmly on actual events it would be easy to forego anything resembling character development but both Graham and Bradlee blossom throughout. Both of them having been blessed with mixing with the likes of JFK and people high up in government are asked to take stock of where their loyalties really lie, with their friends, or to the story. One scene sees Hanks recount a tail about when being in JFK’s company the then President assumed he would only be interested in getting a story, when Bradlee only ever saw Kennedy as a friend, not a source. The icing on the cake is the way Spielberg and writers Liz Hannah and Josh Singer manage to make The Post a direct prequel to that other iconic Washington Post film All The President’s Men. So brilliant is this simple moment it will have film fans and historians alike beaming with delight.